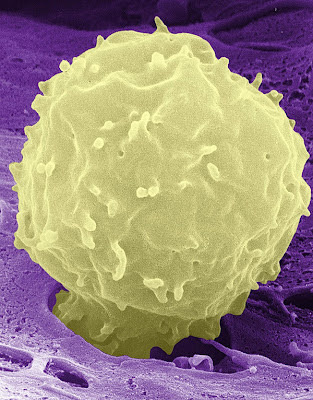 This is a false-colored, scanning electron micrograph of a neutrophil. White blood cells are cells of the body's immune system involved in defending the body against both infectious disease and foreign materials. 50% to 70% of these white blood cells are Neutrophils. Neutrophils are phagocytic. They have the ability to ingest other cells. Whenever there is an infection or a foreign material introduced to the body, neutrophils are the first of the immune cells to arrive at the area of infection. Neutrophils have an average life span of five days although inactive neutrophils live for only four to ten hours. These cells die upon ingesting a pathogen. They are abundant and are responsible for the bulk of an immune response. They are the main component of pus and is the reason why pus has its whitish color. They are present in the bloodstream until signaled to a site of infection by chemical cues in the body. They are fast acting and arrive at the site of infection within an hour. Before ingesting invasive bacteria, neutrophils can release a net of fibers called a neutrophil extracellular trap (NET), which serves to trap and kill microbes outside of the cell. When neutrophils ingest microbes, they release a number of proteins in primary, secondary, and tertiary granules that help kill the bacteria. They also release superoxide, which becomes converted into hypochlorous acid, or chlorine bleach, which is theorized to play a part in killing microbes as well. Researchers at the University of California, San Diego School of Medicine say neutrophils, an abundant type of white blood cell typically tasked with attacking bacteria and other foreign invaders, also plays an unexpected role in mediating insulin resistance – the central characteristic of type 2 diabetes, which afflicts an estimated 26 million Americans. The findings are published in the August 5, 2012 Advance Online Publication of Nature Medicine. Neutrophils are the first immune cells to respond to tissue inflammation, and can promote chronic inflammation by summoning other white blood cells called macrophages. Chronic low-grade inflammation – common in adipose or fat tissue – is an important cause of systemic insulin resistance. Using liver and fat cells from mice and humans and live mouse models, a team led by Jerrold M. Olefsky, MD, associate dean for scientific affairs at UC San Diego Health Sciences and professor of medicine, discovered that an enzyme secreted by neutrophils called neutrophil elastase (NE) impairs insulin signaling and boosts resistance. Conversely, deletion of NE in obese mice fed a high-fat diet improved insulin sensitivity. "These results are largely unexpected," said Da Young Oh, an assistant project scientist in Olefsky's lab and study co-author. "Although several immune cells have been established in the etiology of insulin resistance, the role of neutrophils in this process has remained unclear until now." Oh said neutrophils were considered to be "transient infiltrates," temporary cells (average lifespan: 5 days) that were incapable of sustaining chronic, low-grade inflammation. "Our studies now suggest neutrophils possess powerful immune modulatory effects," Oh said. Specifically, neutrophils use NE to activate a signaling pathway which triggers pathogen-eating macrophages to secrete proinflammatory molecules called cytokines. NE degrades IRS1, a key protein in the insulin signaling pathway in both liver and fat cells. Although NE has been shown to degrade this protein in lung cancer cells, the scientists said, the effect on insulin target tissues such as liver and adipose is striking. The insulin-mediating role of neutrophils makes them a new target for developing treatments of insulin resistance in particular and diabetes in general. "Given that NE mediates insulin resistance, one could, in theory, take an NE activity inhibitory approach to reverse or improve insulin resistance," Oh said, noting that NE inhibitors are already used for treatment of emphysema in Japan and are being tested in the United States, both for emphysema and type 1 diabetes.